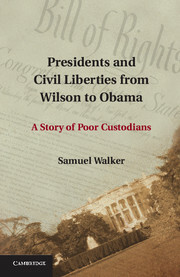 This week we're reading Presidents and Civil Liberties from Wilson to Obama by Samuel Walker. Click here to read or download the entire introduction. For his signature, Attorney General Francis Biddle presented President Franklin D. Roosevelt with Executive Order 9066, authorizing the military to evacuate people from the West Coast of the United States. Roosevelt promptly signed it. Within months the government removed 117,116 Japanese Americans and interned them in Relocation Centers, which have been properly called concentration camps. At least seventy thousand of the internees were bona fide American citizens. Many lost their homes and businesses. Historians generally regard the treatment of the Japanese Americans as the greatest single violation of civil liberties in American history. President Roosevelt had no qualms about signing Executive Order 9066. He expressed no concerns about its legality and ignored information on his desk that the overwhelming majority of Japanese Americans were loyal to this country. Nor did he ever express regrets about his decision. Nearly three thousand Americans had died in the Japanese attack on Pearl Harbor just two and a half months earlier, and many feared that the Japanese might attack the continental United States itself. Military officials argued that security required evacuating all people of Japanese origin from the West Coast to prevent espionage and sabotage. Several Justice Department lawyers objected, arguing that it would be wrong and unnecessary. Both the Federal Bureau of Investigation (FBI) director, J. Edgar Hoover, and the Office of Naval Intelligence reported that there were only a few potential spies or saboteurs among the Japanese Americans. Roosevelt sided with the military, however, and signed the order, setting in motion a terrible tragedy. Four days after being sworn in as president after the assassination of John F. Kennedy, Lyndon Johnson consulted White House advisers about his forthcoming speech to Congress and the nation the evening of November 27. He wanted the speech to heal the nation and define the goals of his presidency. The group was a mixture of his own staff and Kennedy advisers. Musing out loud, he said he was thinking about making the pending civil rights bill his top legislative priority. Although it eventually became the historic 1964 Civil Rights Act, the bill at that point faced a very uncertain prospect in Congress, with strong opposition from southern segregationists and Republican conservatives. Johnson understood power, and the special power of the presidency. Since his first days as a public official in 1936 he had been deeply committed to ending racial segregation in America. The day after consulting his advisers, he told the nation that the civil rights bill was his top priority and that he wanted it to be a memorial to the slain former president. Congress passed it the following year, and the 1964 Civil Rights Act is today regarded as one of the most important laws in American history, defining racial equality as national policy. A year later Johnson again used his special influence as president to secure passage of the 1965 Voting Rights Act, an equally important law in the cause of racial justice.